Stricklen tallied 24 points (8-13 FG, 8-11 3Pt), five rebounds, three steals and two blocks across 36 minutes for the Sun in its 92-75 win over the Wings on Sunday. 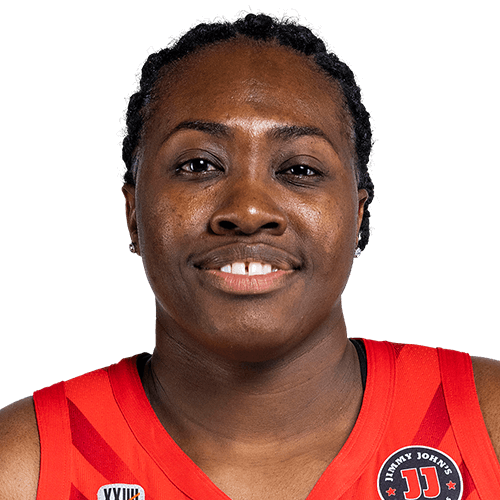 Stricklen's eight three-point buckets tied the WNBA record for a single game, which was established by Phoenix's Diana Taurasi (and equaled by Taurasi two other times) and matched by Riquna Williams of the Tulsa Shock in 2013. The 8-for-11 showing from distance boosted Stricklen's three-point accuracy rate to 42.4 percent, which ranks sixth in the league. Stricklen had five points (1-7 FG, 1-5 3Pt, 2-2 FT), two rebounds and one steal in Tuesday's 92-80 loss at Washington. Stricklen struggled mightily from the field during the loss Tuesday by converting just one-of-seven field-goal attempts. It was her 11th start of the season and she is currently averaging 18.2 minutes across 14 games while adding 6.1 points per outing. Stricklen managed six points (2-8 FG, 2-8 3Pt), one rebound and one assist in Tuesday's 82-77 loss to the Dream. Every one of Stricklen's field-goal attempts Tuesday were from behind the three-point line and she only managed to convert two-of-eight from deep. On the short season so far, the 28-year-old is shooting 36.4 percent overall from three-point range through the first six games. Stricklen was held scoreless (0-4 FG, 0-3 3Pt) and added one rebound in the Sun's 110-72 blowout victory over the Sky on Friday. In just under 13 minutes, Stricklen started for the fourth straight game but failed to convert any one of her four field-goal attempts in the win Friday. The seventh-year guard is currently averaging almost three points less than last season's average of 8.6 points while also seeing her rebounding decline as well. Stricklen totaled three points (1-6 FG, 1-4 3Pt), one rebound, one assist and one steal during Friday's 74-58 preseason win over Atlanta. Stricklen started the preseason match up at the power forward position and responded by shooting the ball poorly, as she only made one field-goal on six attempts. The six-year veteran did start all but five games last season and it's likely that she will continue that role for at least the start of 2018. Stricklen averaged 8.6 points and 3.1 rebounds during the 2017 season. Stricklen re-signed with the Sun on Thursday, Doug Feinberg of the Associated Press reports. Stricklen had one of the more productive seasons of her career in 2017, getting on the court for 27.3 MPG and posting the best three-point percentage (41.0) and free-throw shooting percentage (86.5) of her career. Last year was also one of her best defensive seasons, as she showed her improvement int hat area by averaging a career-best 1.2 steals per contest. She'll now return to Connecticut for her seventh WNBA season -- fourth with the Sun. Stricklen supplied 15 points (5-11 FG, 3-7 3Pt, 2-2 FT) and two steals across 31 minutes during Saturday's 96-88 victory over the Wings. Stricklen is one of the most high-risk/high-reward fantasy options available. While she averages just 8.3 points, 2.9 rebounds, 1.3 stels and 1.0 assist across 27.3 minutes, her scoring is usually red hot or ice cold. For example, she's recorded 10 games with double-digit points, as well as two 20-point affairs, but also 11 games with five points or less. She's almost equally hit-or-miss with her supplementary stats as well. For that reason, DFS users should exercise extreme caution when considering deploying Stricklen. Stricklen supplied four points (1-8 FG, 0-4 3Pt, 2-2 FT), five rebounds, a season-high five steals and two assists across 37 minutes during Tuesday's 84-71 victory over the Storm. Though she put up a dud scoring the ball, Stricklen was excellent on defense, swiping a season-high five steals. Her previous season high stood at four -- a feat she achieved on July 16 against the Stars. Impressive defensive aside, Stricklen remains somewhat of a fringe DFS option considering her averages of 8.1 points, 3.0 rebounds, 1.2 steals and 1.0 assist across 27.1 minutes per game. Stricklen is averaging 8.7 points, 3.0 rebounds and 1.0 steal per game while shoot 44 percent from behind the arc heading into this season's All-Star break. Stricklen posted four points (1-6 FG, 1-3 3Pt), five rebounds and one steal across 32 minutes in Thursday's loss to the Sparks. Was coming off two straight games in double-digit scoring, including a season-high 21 points in the team's victory Wednesday over the Storm. However, after shooting 7-of-10 from behind the arc Wednesday, Stricklen's efficiency fell way down. Thursday's performance shows how risky of a play Stricklen can be, but the sharpshooter still has some upside due to her ability to get hot from downtown and score in bunches.